CloudSense is a multi-channel and comprehensive configure price quote platform designed for a variety of industries which include communications, media, government, data center, energy, and logistics. 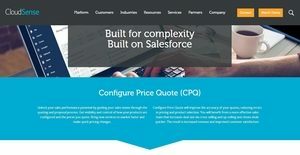 Scalable, reliable, and secure; the CPQ platform helps businesses and their sales teams create accurate quotes, wherein errors in pricing and product selection are reduced. It provides them with visibility and control of the prices they quote and the products they configure. With CloudSense, users will be able to bring new products and services to the market and implement pricing changes faster. Cloudsense, moreover, is built on Salesforce. As a result, users can access the CPQ platform within Salesforce and utilize any data in Salesforce. The CPQ platform also offers user interfaces that are designed for different roles as well as functionalities built for specific industries. Last but not least, CloudSense assists users in coming up with better decisions as the platform bring all their quoting, sales, customer, and product information together. Built on the Salesforce Platform, CloudSense works in harmony with Salesforce. For instance, sales teams will be able to automatically pull in customer information from Salesforce as they prepare quotes and proposals. Sales managers can also track within Salesforce all the comments, documents, and changes while their teams go through the approval process. They can collaborate using the Salesforce Chatter, a social networking and communication solution from Salesforce where users can share files, documents, and interact with their colleagues. Product configuration in CloudSense aims to streamline the sales process. Sales teams are guided by scenario-based workflows that are determined by business logic. These workflows contain questions which help sales teams deliver the right products to their customers. Additionally, using their own business logic, users can configure their products, define their pricing, and combine them dynamically into bundles. With CloudSense, users will be able to generate the right prices for the right people. This is because from a single product catalog, they can come up with pricing that is context specific. Whether the pricing is based on account, partner, or sales channel, the platform provides them with the opportunity to price their products in various ways. Because of CloudSense’s single product catalog, they are ensured that their pricing is consistent and pricing changes are applied quickly. The CPQ platform delivers the capability to customize proposal templates so users can make sure that the way their quotes are presented is consistent with their brand and has a uniform format. As they create quotes and proposals, the platform lets them automatically import data from the product configuration and even from external systems. CloudSense is an omnichannel CPQ platform. No wonder that it is built with user interfaces for different sales channels. This way, sales teams, customer service agents, field sales teams, and partners can perform their roles better through the aid of such user interfaces. In CloudSense, approval processes are automated. Users can create their own rules for their approval process depending on each scenario. Likewise, the platform helps them automate the communication and reporting throughout the steps of their approval process. CloudSense also automates the processing of orders. New orders are automatically created for every successful quote. In adition, as users fulfill orders, they can apply changes on the fly. To wrap it up, the CPQ platform is equipped with flexible dashboards and detailed reports which allow business owners and sales managers to gain actionable insights into the performance of their teams and commerce operations. They will be able to understand the financial impact of every quote their teams generate as well as forecast their revenues, margins, and costs. If you are considering CloudSense it may also be sensible to check out other subcategories of Best CPQ Software collected in our database of B2B software reviews. It is crucial to realize that virtually no service in the CPQ Software category is a perfect solution able to meet all the goals of different company types, sizes and industries. It may be a good idea to read a few CloudSense reviews first as some solutions may excel just in a very narrow group of applications or be prepared with a very specific industry in mind. Others may operate with a goal of being easy and intuitive and consequently lack advanced features desired by more experienced users. You can also come across apps that cater to a broad group of customers and give you a complex feature toolbox, but that frequently comes at a higher price of such a service. Be certain that you're aware of your needs so that you buy a solution that offers all the functionalities you search for. How Much Does CloudSense Cost? CloudSense SMB and enteprise pricing plan information is available only upon request. Please contact the company for more details, and get your quote. We realize that when you make a decision to buy CPQ Software it’s important not only to see how experts evaluate it in their reviews, but also to find out if the real people and companies that buy it are actually satisfied with the product. That’s why we’ve created our behavior-based Customer Satisfaction Algorithm™ that gathers customer reviews, comments and CloudSense reviews across a wide range of social media sites. The data is then presented in an easy to digest form showing how many people had positive and negative experience with CloudSense. With that information at hand you should be equipped to make an informed buying decision that you won’t regret. What are CloudSense pricing details? What integrations are available for CloudSense?